Recently we've been working at the far northern end of the Central & Eastern Lakes property, over at Wetheral Woods, a few miles outside of Carlisle. Wetheral Woods is a twenty-one acre broadleaved woodland and is home to St Constantine's Cells, a hermit's refuge that is thought to have been in existence during the Roman times. Our work was to clear away any overhanging branches and repair the footpath, as over the years it had started to become narrow and sloping towards the river. Our first job was to dig the bank next to the path that had started to fall away. We would then be able to erect some shuttering to prevent the side of the path from eroding away any more. Once we'd dug out a long enough section of the banking, we used wooden rails to create the shuttering, these were firmly attached with nails to some long wooden fence posts to keep them in position. With all the shuttering in place we used a couple of the large trees that had been felled in the past to create a new edge. The trunks of the trees were cut into three metre sections and then rolled into position next to the path. A trench was dug out where we wanted the path edge to be, and the logs were then sat into this channel. Finally we knocked in some posts against the logs to stop there being any chance of them moving. On occasion when the river Eden floods it has been known to reach the path. To try and give the path a bit more protection we laid a couple of trees in the most vulnerable area, to produce a short section of hedgerow. We also took a few cuttings from a nearby willow and planted them up. We're hoping that if the hedge has the chance to grow for a few years, without being damaged by floodwater, it should help to stabilise the bank and reduce the damage to the path in the event of any flooding. Finally, to finish off we graded the bank (on the left hand side of the picture below) to make the path slightly wider and level out the worst of the undulations. With our work finished on the high fells until the spring we've been getting out to a few different places around the property and we've recently been working over at Aira Force. Our first job was to replace a set of old wooden risers, with some new slate ones, and also build a stone drain higher up the path, to help protect the new work. It's quite a change working somewhere like Aira Force, although the work is still mostly footpath repair work as it is in a more formal environment it's essential to get everything looking just right. It seems quite alien to be using a spirit level and tape measure while constructing a new path! But still the path quickly started to take shape. With all the risers in place, it was just a matter of building up a short section of wall and gravelling between the steps. The new path should now be much more user friendly. Our next job was to replace a section of wooden revetment that was retaining a gravelled footpath. As you can see in the photo below, the weight of the gravel has started to push out a section of the edging and the path has started to fall away. The first thing to do was to dig out around the boards that had started to move out of place. We dug down a couple of feet until we reached the very bottom of the revetment, and then removed the whole section. Next we made sure everything lined up correctly and marked out where we needed to put the new posts. Once we'd decided where the posts should go, we made some fresh holes for them with a crow bar and, as is often the way, found the bedrock just below the surface. Fortunately the bedrock was relatively easy to break so we managed to knock the posts deeply enough into the ground. Just to be on the safe-side we added a couple of additional posts to help give the new section a bit of extra strength. Once this was done it was just a matter of nailing the reused rails back on to the posts and filling in with some fresh gravel. After a good winters break to recover from our exertions in 2011 we're now back and steadily getting up to speed. For the start of the new year, we'd like to unveil our new poster. You may have actually seen it around already as a few have been leaked, and one is already on the wall at the National Trust's Grasmere Information Centre. 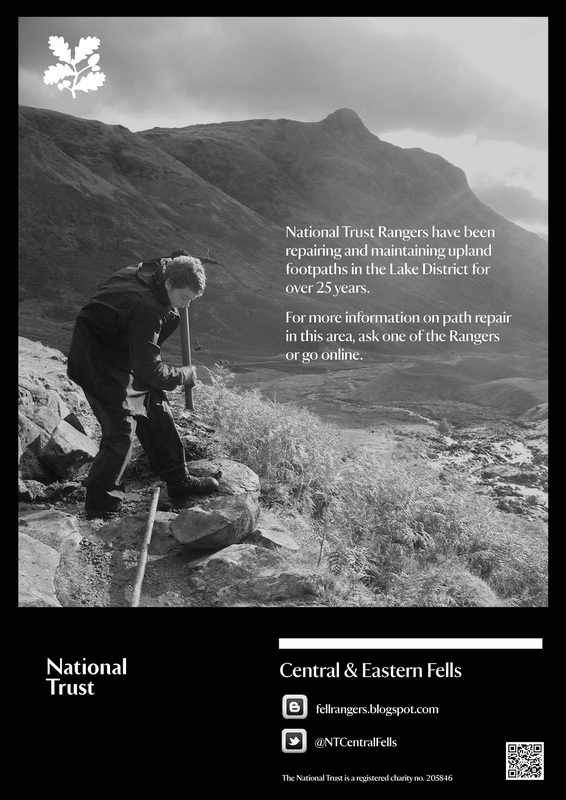 The poster was created solely by the Fell Ranger Team and will hopefully help people to get a little more information about the work that we do and in turn also highlight the problem of footpath erosion. The new poster will be displayed at our work sites in conjunction with our warning sign. The idea being that if you're out walking the fells and stumble across one of our work sites, if it's one of our days off and there's nobody to talk to, it'll be a bit easier to find out what's been going on. The posters should also be appearing sometime soon at the National Trust car parks in Langdale. We do realise that some people would rather not see any signage out on the fells but hopefully with the poster being in black and white it should be eye-catching but not too intrusive. Of course, it'll only be temporary and when we move to a new site the posters (made out of a durable vinyl, with waterproof ink) will come with us. We would be really interested to know if you've seen one of our posters and what you think of it.